A testament to the combination of soft synths and ambient spirit, Hollan Holmes’ debut, A Distant Light, is a well-crafted spacemusic disc that unfurls the solar sails with its first note and sets a course for the furthest star. With only the Reason and Cubase software programs as his instruments, Holmes pulls off eight tracks infused with uplifting energy woven through with a sense of peace and the definite feel of a far voyage. Despite its computer-generated genesis, A Distant Light displays a rich, organic sound that’s broad and warm. (Credit here can be shared with Steve Roach, who mastered the disc for Holmes.) In spots, as with the opener, “Drift” and “Threshold,” Holmes gives his spacious drifts a deeper character with delicate pulses that stand in for rhythm. It’s more distinctly on display in “Malus,” where the beat rises and dances around under airy notes that exhale a simple and understated melodic line. In “Wellspring” Holmes hits perhaps his most energetic stride, a high-speed sequenced cadence running through washes and bold chords. A Distant Light shifts tone a couple of times, and the movement is always subtle, natural and sensible. Nothing interrupts Holmes’ flowing journey. It’s about the ride, the changing starscape out the portal window, the voyages both inner and outer. Holmes manages to pull off one of the few darker shifts on the disc with “Inevitability,” the music taking on a grim, emotional edge marked by hull-shaking minor chords. The last, a rolling shockwave that comes 45 seconds from the end, potently underscores Holmes’ ability to create moments in the sound. I have to think that Holmes’ background as a graphic artist translates to this easy ability to blend tones and textures, to mix the media (as it were), to craft larger images in smaller strokes. I imagine that Holmes doesn’t see notes or software algorithms on the screen as he composes. I imagine he sees only the images emerging from the newly birthed sounds. A Distant Light is an impressive debut, a trip I’ve taken many times over. It’s broad enough to appeal to a spectrum of ambient/electronic listeners, and deep enough to stand up to repeat listens. 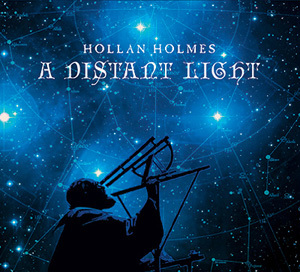 Holmes is at work on his second disc, and I have to say that A Distant Light has already made me eager to hear what else this new talent can do. Available from Hollan Holmes’ web site.